If you're coming from a Web Forms or LightSwitch background, then you've probably noticed that, without the controls and designers that make configuration easy, designing apps in MVC requires some extra effort. 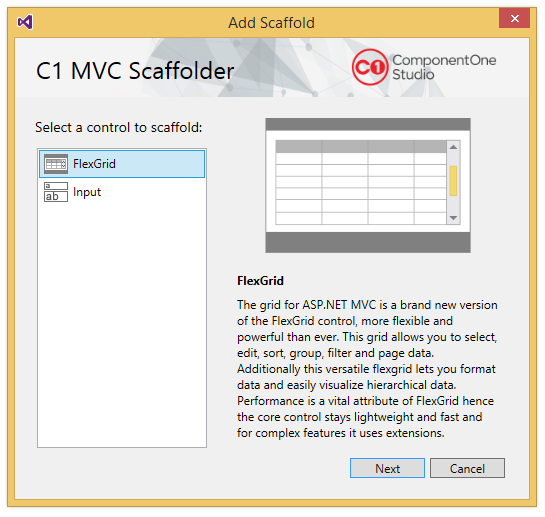 With our recent release of MVC scaffolding for FlexGrid and Input controls, you'll find that creating views with ComponentOne MVC Edition controls is a breeze. Scaffolding is a code-generation framework for ASP.NET web applications that allows developers to quickly generate views and controllers based on the model present in the application. Using scaffolding, you can create code-free views and save considerable time. 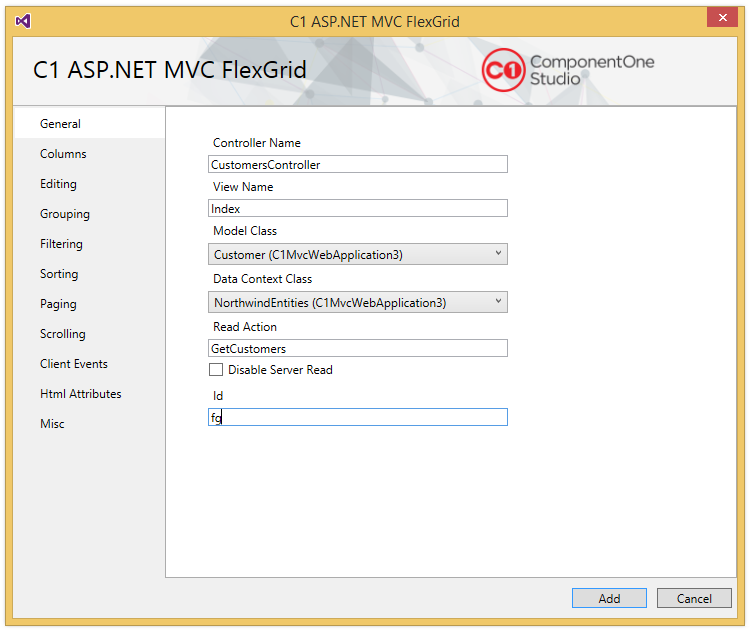 C1Studio MVC Edition includes scaffolding for FlexGrid and Input controls. These scaffolders get installed when you install MVC Edition from the installer. They're supported in Visual Studio 2015 and 2013, and if you're using ASP.NET Core, the scaffolders use TagHelpers syntax automatically. Let's walk through how to get started with the scaffolders. 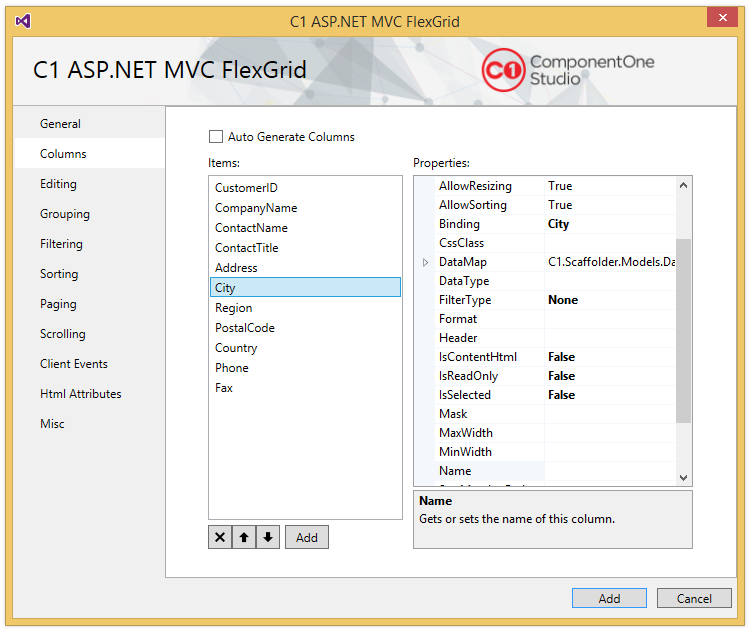 When you create a new project using C1MVC Template, use the standard Visual Studio template to create the MVC project. Using the C1 templates has the advantage of preconfigured references and resources. Add an Entity Framework model to the project. (This example use the Northwind database). Save and rebuild the project. Right-click controllers and click Add New Scaffolded Item. In the Add Scaffold wizard, select Common. Select FlexGrid control and click Next. Fill in the Controller Name and View Name. Select Model Class from the drop-down list. The list shows all the available model types in the application in addition to the NWind.edmx model added in Step 1. In our case, we select Customers to populate customers in the FlexGrid. Select Data Context Class from the drop-down list. In our case, we select NorthwindEntities. Go to the Editing tab and check Allow Edit and Allow Delete checkboxes. Go to Grouping tab. In the Group Settings, check Show Groups and Show Groups checkboxes from Show Groups. Go to Show Groups tab and check Show Groups checkbox. Let the other settings be same as default. Go to Show Groups tab and view the defaults; both Allow Sorting and Show Sort checkboxes should be checked. If you need to subscribe to any client side method, go to the Client Events tab and check the relevant client method checkbox. Click Add. This generates the code for required controller methods and Views Razor syntax. // Implement the event handler for formatItem.